THIS WEEK the governments of Nunavut and the Northwest Territories launched a “first of its kind” curriculum, the focus of which is Canada’s discredited Indian Residential School System. The Honourable Jackson Lafferty, Deputy Premier of the Northwest Territories, and the Honourable Eva Aariak, Premier of Nunavut, attended a Yellowknife ceremony to mark Canada’s formal commencement of a project urged sixteen years ago by the Royal Commission on Aboriginal Peoples (RCAP) and urged again in more recent years by the Truth and Reconciliation Commission of Canada, or TRC. It happens that I played a small role in the development of this curriculum, as an editor and writer. I mention this by way of disclosure and to breach the point that this work has constituted a personal as well as a professional challenge for over a decade. The development and “implementation” of school curriculum is an enormous undertaking, upon which bear considerations of history, bureaucracy, ethics, politics, economics and academic standards. I recall the long conversations about the tangled business of curricula that I had with the late Gail Valaskakis, a former colleague, Aboriginal communications pioneer, and Concordia professor. (Curriculum was one of the very few ambitious projects she took on but did not finish.) 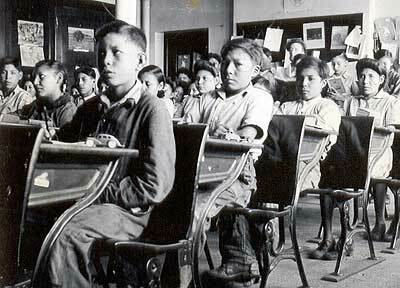 As early as the 1990s, those of us tasked with writing about the Indian residential schools well understood that the education system was a final frontier, even a reckoning. I considered myself a fairly informed person, and yet my knowledge of residential schools was empty. Why didn’t I know this when I was going to school? It made me question who tells us what our history is, when it comes packaged in a textbook that goes out all across the country. I don’t think there was even a reference to residential schools in my history textbooks. What is the real history of Canada? I’m in love with this country, and now I’m finding out after years of loving the beauty of the country that the way we came to be a country was by taking things and stealing things. We’re living off of stolen land. This made me question our very ability to stand with integrity on this land. Some of you will doubtless cast this away as a “liberal” perspective, and in the years that I’ve written about Canada’s Indian Act policies I’ve had to field my share of indignant emails and letters from readers who’ll have none of it. “Get over it,” they say, adding (incongruously) that nobody has it better than the natives. I learned years ago that some dogs are in fact too old for the new trick, and so my interest in educating the young — not a trick, but rather a tricky affair — has only been fattened on such scraps. The relationship between native people and the governments of what became Canada was not always the discouraging affair it is today. The mess of the present has a recoverable past which may be studied, deliberated and debated. Disagreements, such as over policies and intentions, are themselves useful — provided they are intellectualy honest and grounded in the substance of Canada’s history. Only with a more complete and integrated understanding of how Canada came to be a nation spanning from sea to sea can its citizens stand, as Shelagh Rogers put it, “with integrity on this land.” I would add that a fuller and more nuanced understanding of the past and present legal and historical relationships of indigenous people and the crown will serve our children and grand children well. In any case, the country took a decisive step this week, and I expect that there will be no turning back. This article appeared in the Huffington Post. This entry was posted in First Nations and tagged Gail Valaskakis, Indian Residential Schools, Jeff Thomas, Northwest Territories, RCAP, Royal Commission on Aboriginal Peoples, Shelagh Rogers, Where Are the Children. Bookmark the permalink. Congrats on this highly important work. I can’t believe this is only happening now! North Americans and in general , I believe all nations need to consider overhauling our ideas of nationalism. I hope to meet you or more people like you who are willing to talk about nationhood in these sober terms….